A booming suburb, homeowners and tenants in Parkwood may find their television signal dropping out from time to time. Whether it’s due to living in a share house and having multiple televisions or your signal is interrupted due to state forest, having the right antenna will certainly help in boosting your television signal. One of the benefits to living in Parkwood is that you don’t have high rise buildings interrupting your signal, however, you may still have old or damaged equipment or antennas that just aren’t working anymore. The equipment in your home – most homes simply need a good quality antenna, a good cable and a good fly lead. Without these, your signal is likely to drop in and out. 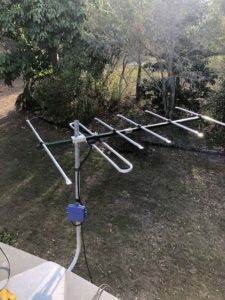 Professional installation – if your antenna has moved in the wind or during a storm, you may simply need the antenna re-aligned towards the TV tower in Mount Tamborine. Regular maintenance – ensure your TV antenna isn’t broken, old, rusty or missing parts. If you feel like your antenna or the parts may need replacing or maintenance, call Home Style Antennas. We can check out your antenna, as well as the cables and leads to see what is going on – it may be a very simple fix! When it comes to boosting your signal there are two options – a masthead amplifier or a distribution amplifier. While the masthead amplifier is good for those areas in poor TV coverage (due to mountains, trees, high-rises etc), Parkwood isn’t in one of those areas, and you are unlikely to need a masthead amplifier. If you are living in a share house and you have poor TV signal, you may need to consider installing a distribution amplifier, especially if you have more than one television running from one antenna. These amplifiers are also a good option for townhouses and villas where the properties may share an antenna between two or more homes. Don’t fit the above? You may need your antenna replaced. There are some factors to consider before going down this road, and Home Style Antennas can run you through your options to ensure you get the best signal possible at home. Any plans to connect more than one television to the antenna. If you’re having problems with your television signal, give Mantas at Home Style Antennas a call. Whether you need a new antenna or just a new cable, Home Style Antennas will get your signal back in no time.